Designed specifically to accomodate AAI vault tables and trainers fitted with CFS bases. Mats attach securely with hook and loop fastener to provide a stable, level 4' x 8' spotting surface. Available in both 12cm and 20cm thicknesses. 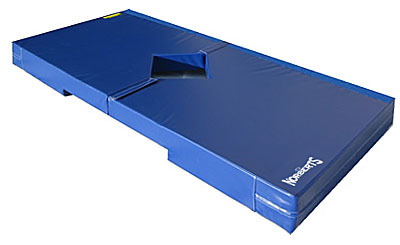 Both 12cm and 20cm Vault Anchor Mats are covered with durable 18 oz. coated vinyl. 12cm mats are filled with a top layer of 3.5cm (­1.375") crosslink over a second 8.5 (3.35") thick layer of prime 70 ILD polyfoam. 20cm mats are filled with 3.5cm (1.375") of crosslink over a 7.62cm (3") thick layer of prime 45 ILD polyfoam and a bottom layer of 8.9cm (3.5") of prime 75 ILD polyfoam. Color choices are royal blue, red, yellow, green, light blue, orange, maroon, grey or black.